I was first introduced to Country Captain from a Throwdown with Bobby Flay episode from The Food Network. Flay went head to head(s) with the charming, dorky, Lee brothers, Ted and Matt Lee. 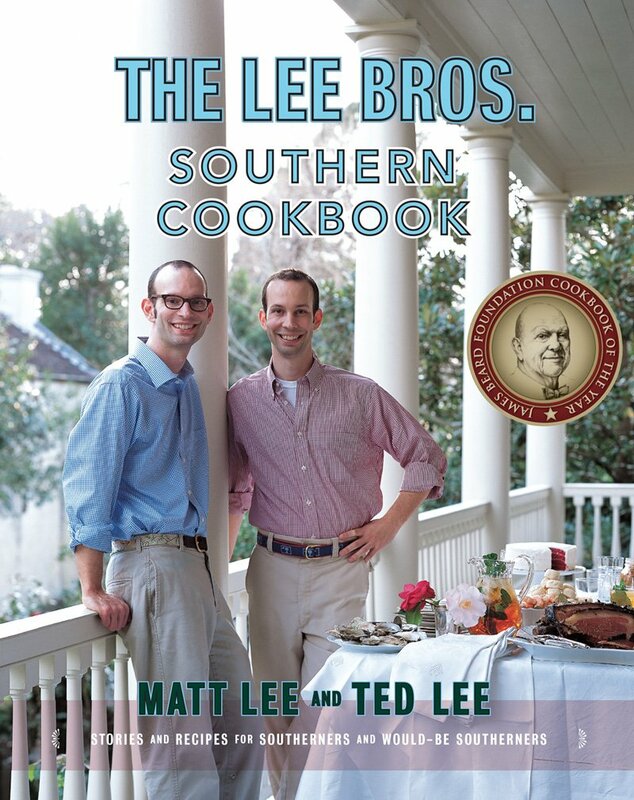 A few Google searches and one Amazon purchase of their book, The Lee Bros. Southern Cookbook, later, Country Captain is now a frequent dish in our kitchen. 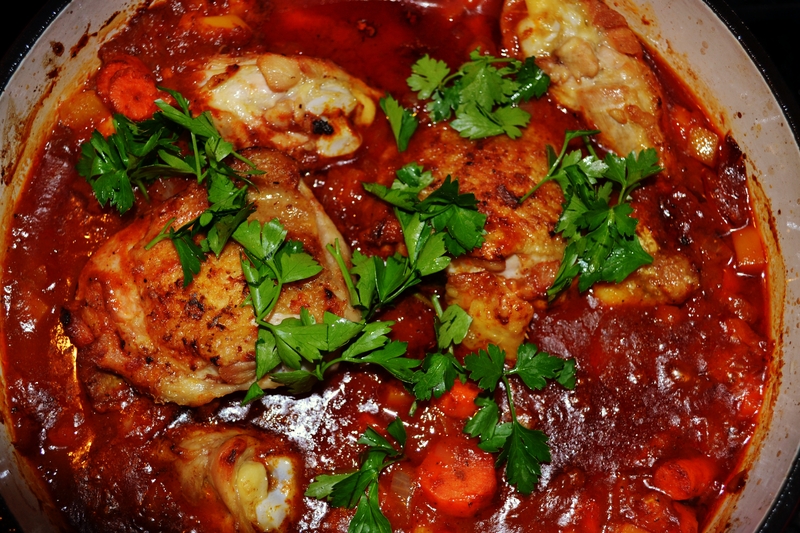 Chicken thighs are lightly browned in bacon fat, then bake in tomato sauce with bell peppers, onion, currants, and a mix of curry and garam masala, served over steamed rice. This delicious dish is easy to make, and tastes even better the next day as leftover. This James Beard award-winning cook book, by the way, is a must have for your book collection. Recipe courtesy of the Lee Brothers and Food Network. 2. Pour the broth into a small saucepan and bring to a boil over high heat. Put the currants in a small bowl and pour enough broth over them to cover. Set aside. 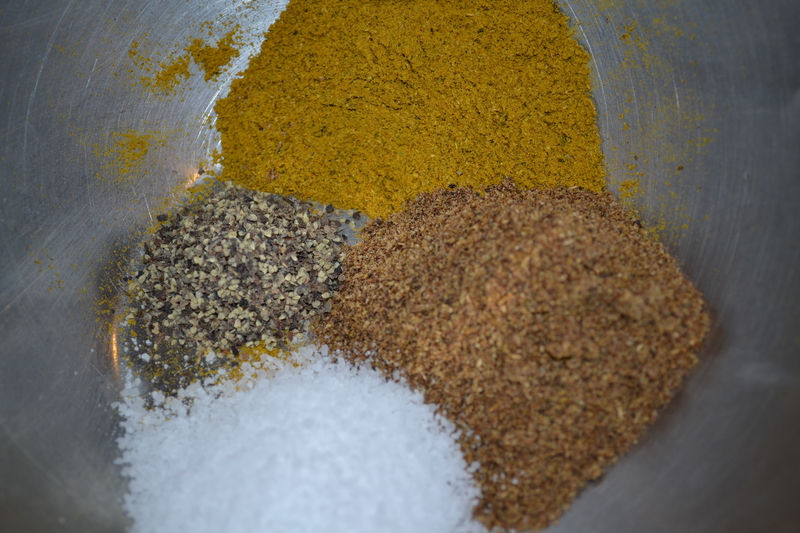 In another small bowl, combine the curry powder, garam masala, salt, and black pepper and reserve. 3. Scatter the bacon in a 4 to 6 quart enameled cast-iron pot or Dutch oven over medium-high heat. Stir the pieces around occasionally until the bacon is firm and just golden brown, about 5 minutes. 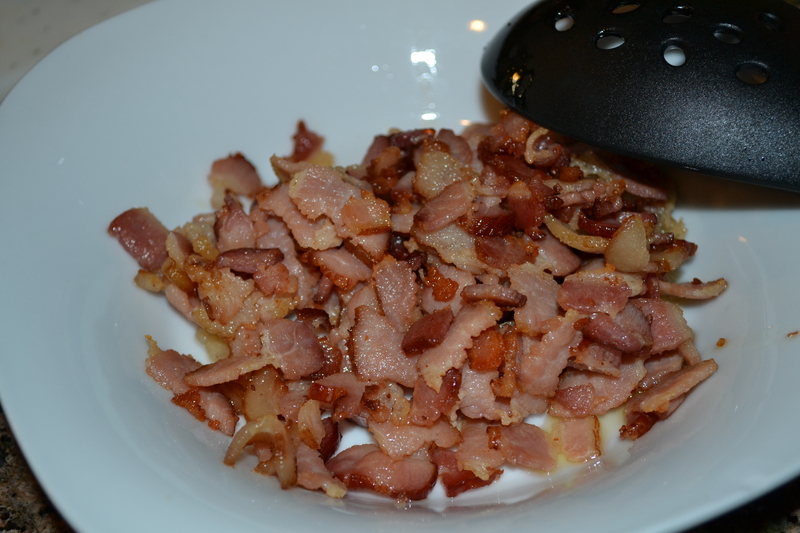 With the slotted spoon, transfer the bacon to a small bowl and reserve. 4. 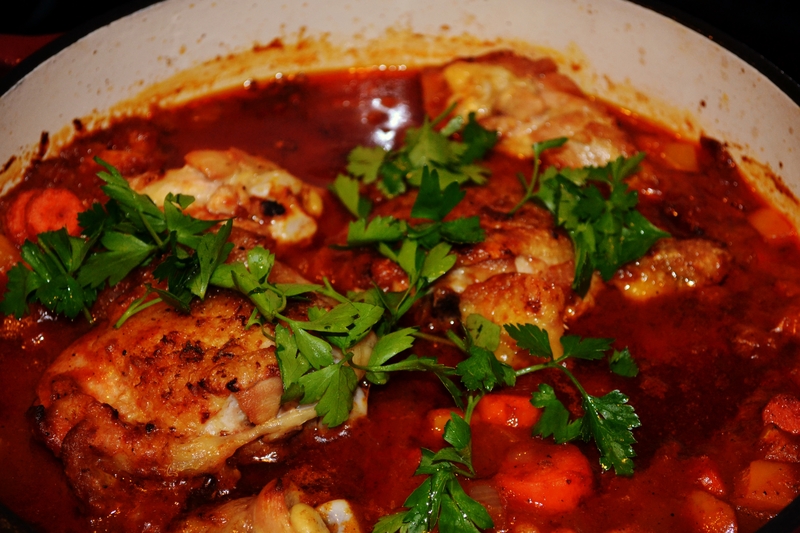 Pour off all but 2 tablespoons of fat from the pot, reserving the excess fat in a small bowl. Brown the chicken thighs in batches over medium-high heat, taking care not to crowd them in the pot, until they are golden brown, about 5 minutes per side. Add the reserved bacon fat, 1 teaspoon at a time, if the pot becomes too dry. Remove the chicken and reserve in a medium bowl. 5. Add 2 teaspoons reserved bacon fat to the pot (if there is none left, use 2 teaspoons canola or vegetable oil). Add the chile and toast the chile in the fat, about 30 seconds per side, until very fragrant. 6. Add the carrots, bell peppers, onions, and garlic and cook until slightly softened, about 6 minutes. Add the tomatoes, spice mixture, ginger, and the currants and their broth. Reduce the heat to medium-low, and simmer until the tomatoes have cooked down to a puree and the sauce has thickened around the vegetables, about 8 minutes. 7. 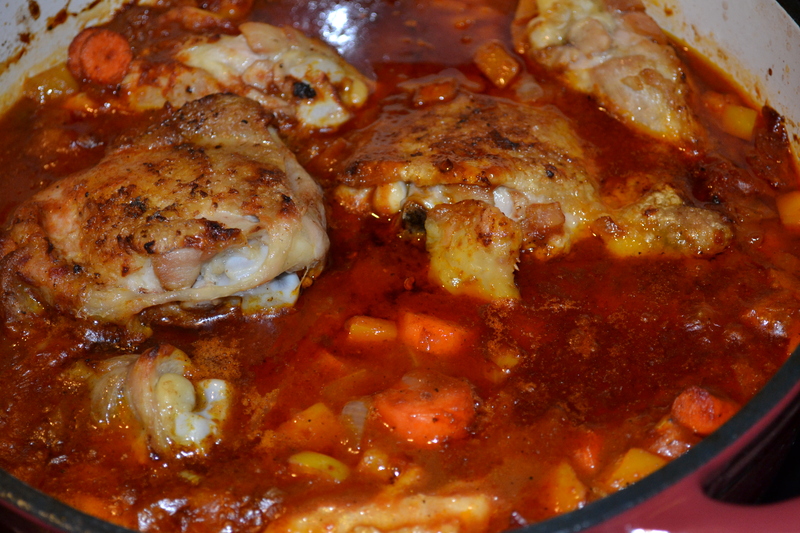 Nest the chicken thighs gently in the vegetable sauce so that the skin side faces up and is above the surface of the gravy. Tent the pot loosely with foil and transfer to the middle rack of the oven. 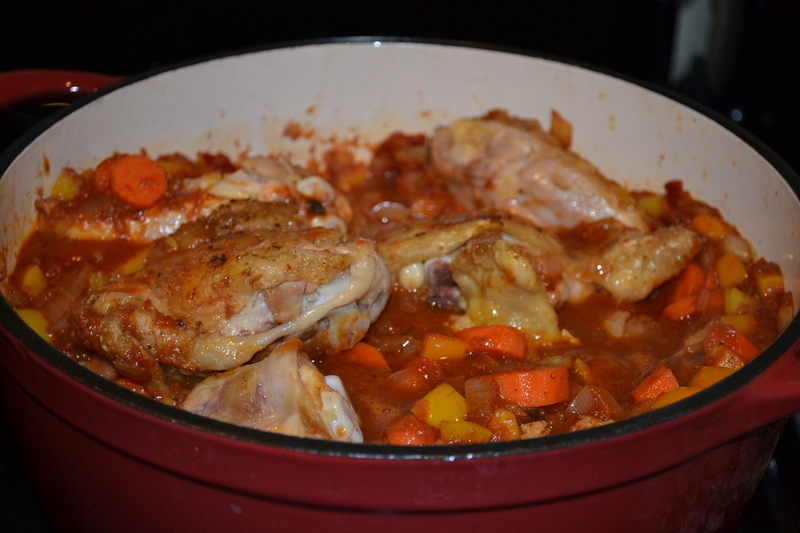 Bake until the country captain resembles a roiling stew around the chicken thighs, about 20 minutes. 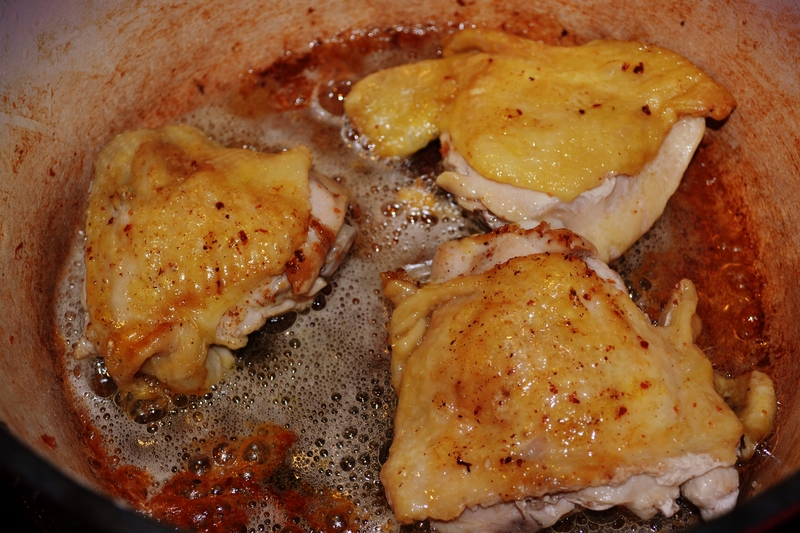 Remove the foil and bake until the sauce has thickened further and the chicken skin is just beginning to crisp, about 15 minutes more. 8. Remove from the oven, skim any excess fat from the surface, and season to taste with salt and pepper. Discard the chile. 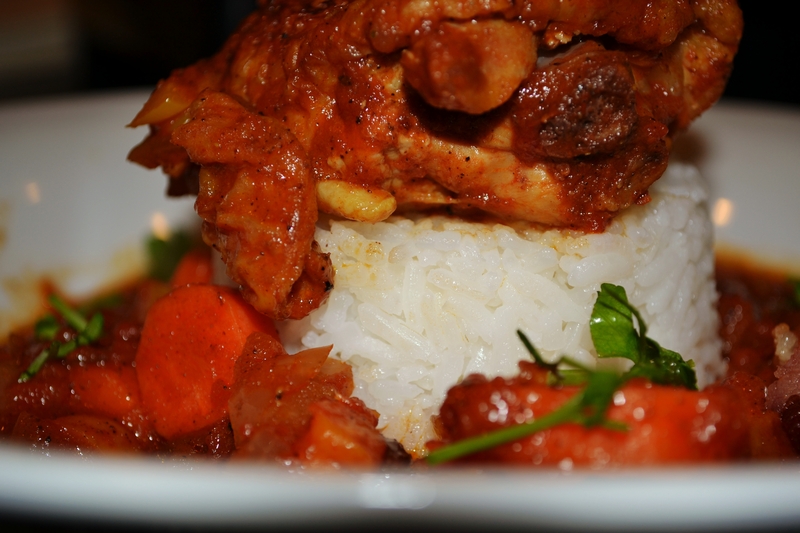 With tongs, transfer 3 thighs to each of 4 wide, deep bowls filled with 1 cup hot white rice. 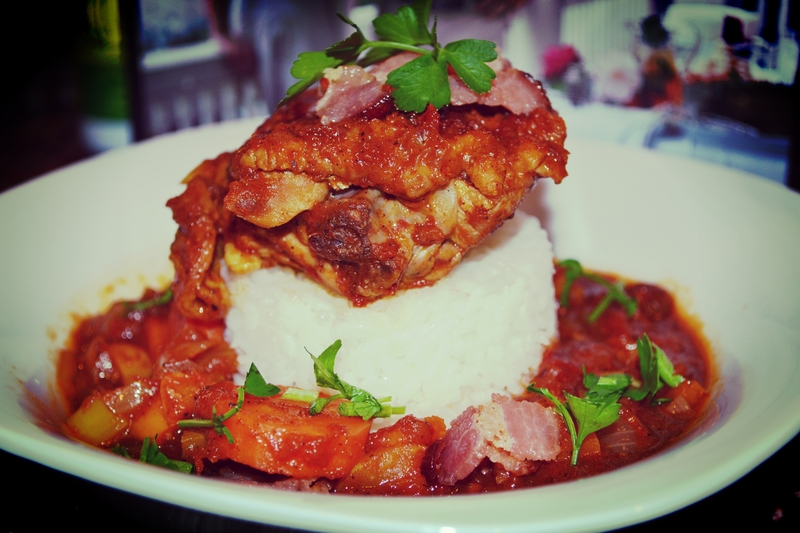 Spoon the sauce over the chicken and the rice and garnish with the reserved bacon, almonds, and parsley. Great vertical presentation in the last images 🙂 While I don’t know how I feel about chicken fried in bacon fat (HAHA) I must admit it looks appealing. So…when are you inviting me over for dinner?